1. I never knew how to worship until I knew how to love. 2. Young love is a flame; very pretty, often very hot and fierce, but still only light and flickering. The love of the older and disciplined heart is as coals, deep burning, unquenchable. 3. Of all the music that reached farthest into heaven, it is the beating of a loving heart. 4. Love cannot endure indifference. It needs to be wanted. Like a lamp, it needs to be fed out of the oil of another’s heart, or its flame burns low. 5. We never know the love of a parent till we become parents ourselves. Excerpt from Wikipedia: Henry Ward Beecher (June 24, 1813 – March 8, 1887) was a prominent, Congregationalist clergyman, social reformer, abolitionist, and speaker in the mid to late 19th century. An 1875 adultery trial in which he was accused of having an affair with a married woman was one of the most notorious American trials of the 19th century. 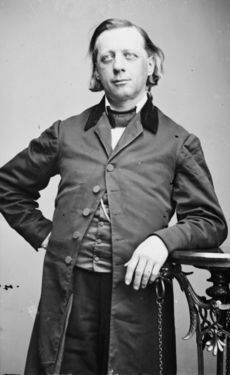 In 2007, The Most Famous Man in America: A Biography of Henry Ward Beecher by Debby Applegate won the Pulitzer Prize for Biography or Autobiography. 1. A man that does not know how to be angry does not know how to be good. 2. A man’s true state of power and riches is to be in himself. 3. A person without a sense of humor is like a wagon without springs. It’s jolted by every pebble on the road. 4. A proud man is seldom a grateful man, for he never thinks he gets as much as he deserves. 5. All men are tempted. There is no man that lives that can’t be broken down, provided it is the right temptation, put in the right spot. 6. Children are the hands by which we take hold of heaven. 7. Children are unpredictable. You never know what inconsistency they are going to catch you in next. 8. Clothes and manners do not make the man; but, when he is made, they greatly improve his appearance. 9. Compassion will cure more sins than condemnation. 10. Every charitable act is a stepping stone toward heaven. 11. Every tomorrow has two handles. We can take hold of it with the handle of anxiety or the handle of faith. 12. Every young man would do well to remember that all successful business stands on the foundation of morality. 13. Good nature is worth more than knowledge, more than money, more than honor, to the persons who possess it. 14. Greatness lies, not in being strong, but in the right using of strength; and strength is not used rightly when it serves only to carry a man above his fellows for his own solitary glory. He is the greatest whose strength carries up the most hearts by the attraction of his own. 15. He is rich or poor according to what he is, not according to what he has. 16. Hold yourself responsible for a higher standard than anybody expects of you. Never excuse yourself. 17. I can forgive, but I cannot forget, is only another way of saying, I will not forgive. Forgiveness ought to be like a cancelled note – torn in two, and burned up, so that it never can be shown against one. 18. I don’t like these cold, precise, perfect people, who, in order not to speak wrong, never speak at all, and in order not to do wrong, never do anything. 19. In this world it is not what we take up, but what we give up, that makes us rich. 20. It is not the going out of port, but the coming in, that determines the success of a voyage. 21. It’s easier to go down a hill than up it but the view is much better at the top. 22. Laughter is not a bad beginning for a friendship, and it is the best ending for one. 23. Our best successes often come after our greatest disappointments. 24. The art of being happy lies in the power of extracting happiness from common things. 25. The difference between perseverance and obstinacy is that one comes from a strong will, and the other from a strong won’t. 26. The real man is one who always finds excuses for others, but never excuses himself. 27. You and I do not see things as they are. We see things as we are. 28. Gratitude is the fairest blossom which springs from the soul. 29. The unthankful heart discovers no mercies; but the thankful heart will find, in every hour, some heavenly blessings. 30. Every artist dips his brush in his soul, and paints his own nature into his pictures. 31. A man is a fool who sits looking backward from himself in the past. Ah! what shallow, vain conceit there is in man! Forget the things that are behind. That is not where you live. Your roots are not there. They are in the present; and you should reach up into the other life.